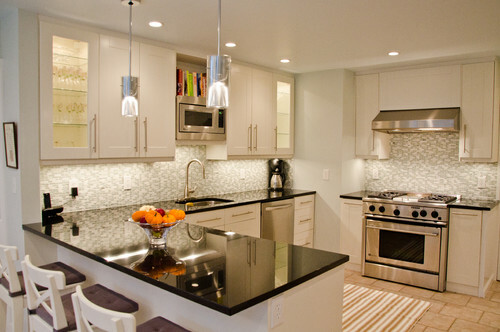 Granite is probably the number one choice for countertops. They are a natural stone and come in many, many varieties. You have probably heard that granite requires maintenance; however, this is a broad statement that is (in large part) a myth. Most commercially available granite does not require anything special. That is because most are not absorbent. So, sealer on these is unnecessary. Just wipe them down with a damp cloth to clean them, and they will maintain their original beauty for years to come. There are, however, a few types of granite out there that do require sealant. These are the ones that are absorbent. If left unsealed they can stain and will suffer over time. To test granite, just place a small spot of mineral oil on the surface. Wait ten minutes, and wipe away. If there is a color change (darkening), then the granite is absorbent and must be sealed. If you see a water ring left behind on granite, that is also a dead giveaway that it requires sealer. 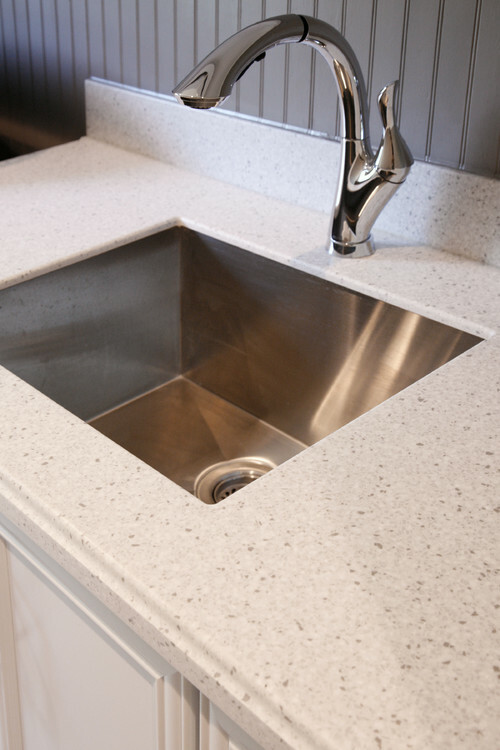 So, if you do not want a granite that requires maintenance, check for absorbency. (I am also providing a link, at the bottom of this post, for those of you who want to read a bit more on testing and sealing natural stones). Polished – to give a good idea of the different finish options for granite, I am using images of absolute black for all types in this section. This image (above) shows absolute black granite in a polished finish. 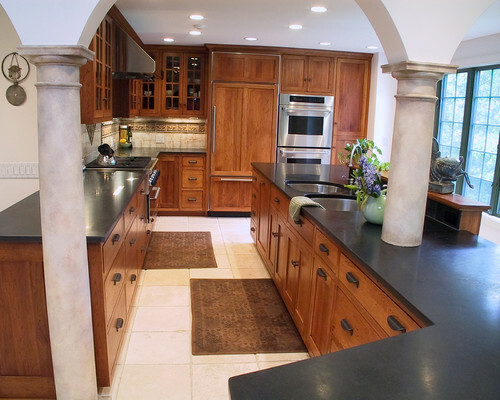 This is the most common finish for granite. It has a high gloss shine to it. This granite will not require maintenance other than regularly wiping it down. 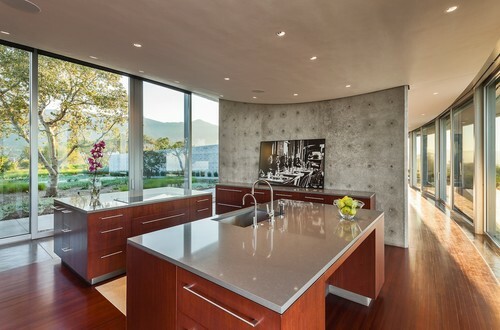 (FYI – A polished finish will make a granite less porous than the other finish types). 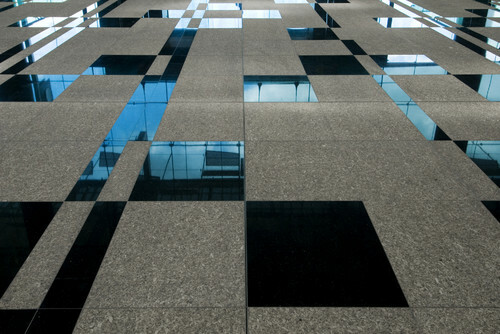 Honed – This image (above) shows how absolute black granite looks in a honed finish. Many people like the look of a honed granite because it has less flash than the polished. It has a soft satiny feel with a matte finish. It is achieved by grinding the stone down in the same fashion as the polished finish, with one exception. They stop the process just before reaching the fine grit that will result in the high gloss look. This finish can show smudges and fingerprints at the beginning. Because of this, a sealer can be applied when installed. However, it should be fine without any future sealant needed. (Test the granite before applying sealer as it may have already been done by the installers. Too much sealer can cause non-porous granite to look dull). Leathered – A new and gaining in popularity finish is the leathered look. This is absolute granite with this finish. I know it is hard to tell by the picture, but it has a textured finish that is different than the honed granite. It is not quite as “matte” as the honed, but has a warm glow. This finish is similar to other rough textured finishes available – brushed, antiqued, etc. They all basically have a textured look, but it is not yet a standard finish. So, a leathered granite at one place may not look exactly the same at another place. For this reason, if you plan to go with one of the textured finishes, be sure to see a sample before finalizing the order. To better demonstrate a leathered finish, I wanted to offer a close up view. To do that, I chose this granite with a lot of color variations. (Black just doesn’t photograph as well as other colors). This should give you an idea of what a leathered finish can look like. Flamed – Traditionally used for exterior surfaces or where slip resistance is needed, the flamed finish is gaining in requests for countertops. It is achieved by heat being added to the surface of the granite. This causes the surface to burst. Above, you can see how absolute granite looks with a flamed finish. The black tile is the polished version of this granite. So, this gives a good comparison of how different a flamed granite will look. 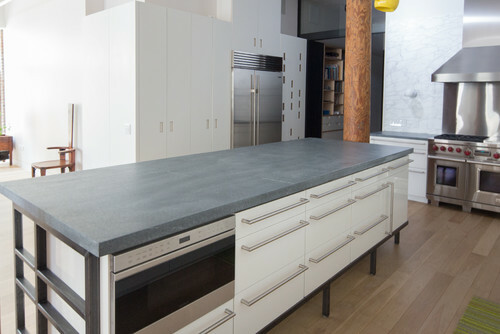 Soapstone is another popular material for countertops. It has veining throughout which is more prominent when the soapstone is oiled. 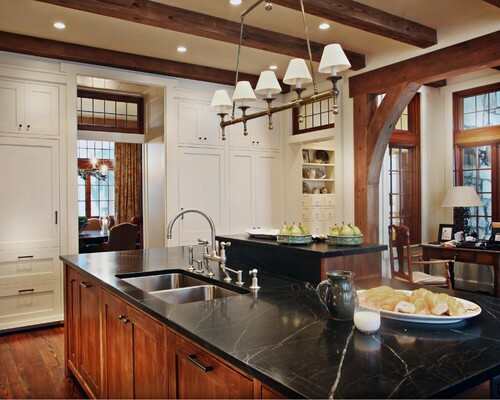 Because soapstone is a non-porous material, it can be left as-is without any worries. However, many people like to deepen the finish (as above) with mineral oil. If left un-oiled, soapstone has a gray appearance with less emphasis on the veining (as seen above). However, don’t expect it to maintain this appearance. Overtime, soapstone will oxidize and grow darker. That is why many people oil it – to speed up the effect. 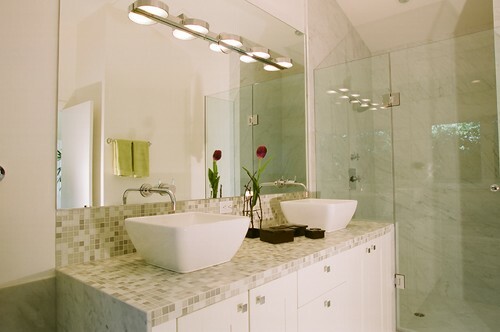 Known for its timeless beauty, marble has several varieties. 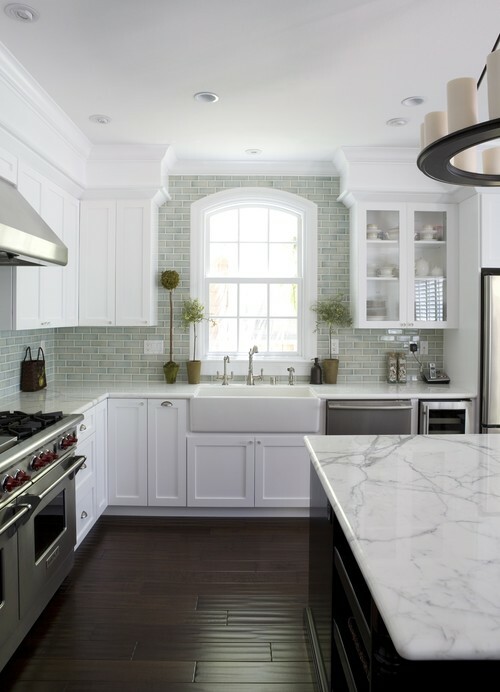 Carrara marble (seen above) is the one that is most often installed in kitchens. However, you should be prepared for the potential problems when choosing marble. 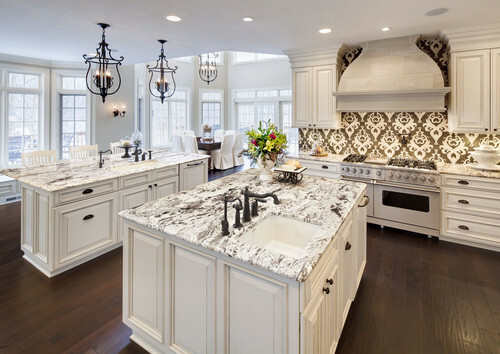 If you want your countertops to always look the way they do when new, you may want to pass on marble. However, if you like the patina that comes with marble’s age, you may be on the right track. Are you a wine drinker? Marble is famous for its never failing power to gain red wine stains. It also etches easily. So, little things, like a slice of lemon being left a bit too long, will result in a mar to the finish. But, if you are quick to clean up after yourself, and there is not much concern for accidents, a marble countertop can be a showpiece. 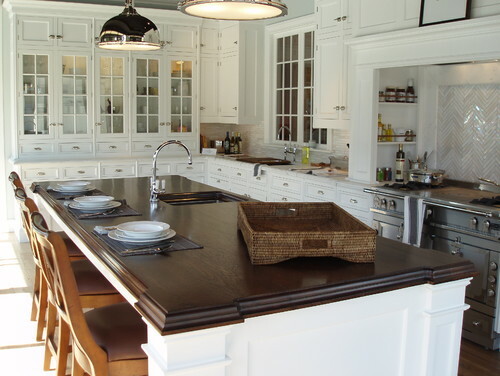 Wood has been popular for creating butcher block tops. But, it is now also being used for its beauty. Above is a gorgeous custom walnut countertop. Walnut is hard enough to withstand everyday wear and tear. Just make sure to have it sealed properly to withstand the moisture as well. This wood countertop is a beautiful heart pine. you’ll notice in both of these examples for wood countertops that the wood butts right up to the sink. In the past, this would have been a nightmare if the water came into contact with the wood. However, there are sealers available, such as Waterlox, that make it possible to have wood in potentially wet areas. In addition to natural materials, there are a number of man made options available. Some were created to provide both beauty and strength, while others serve as lower budget alternatives. Porcelain – A new up and comer has entered the mix recently. It promises to be an alternative to granite, quartz, and marble. Why? Because it can be manipulated to look like just about anything. 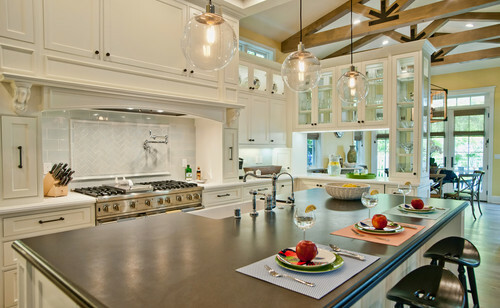 Look to see this countertop option entering your area in the near future. In fact, if you are one of those people who like to be ahead of the trends, this may be the countertop for you. 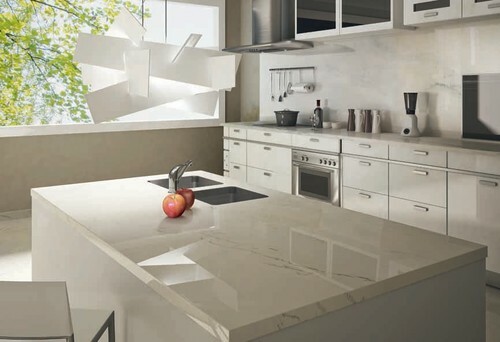 I predict that porcelain countertops will have a long life in the interior design world, once it rolls out. Laminate – If you are on a limited budget, but you want to get something that looks like a natural stone, you may want to consider formica laminate. 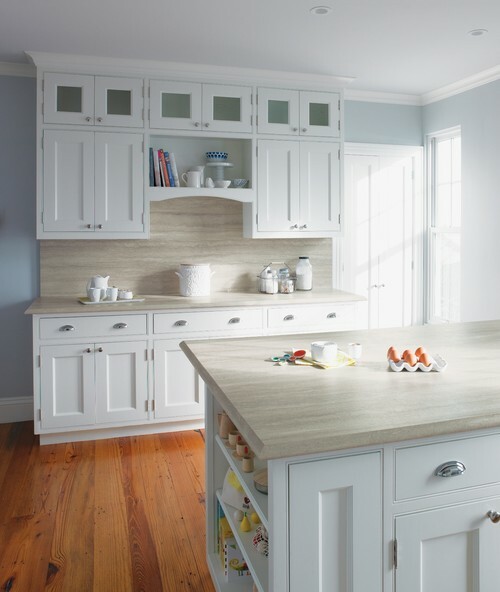 Today, laminate is available in much more than the mottled finishes that are carried by Home Depot or Lowes. 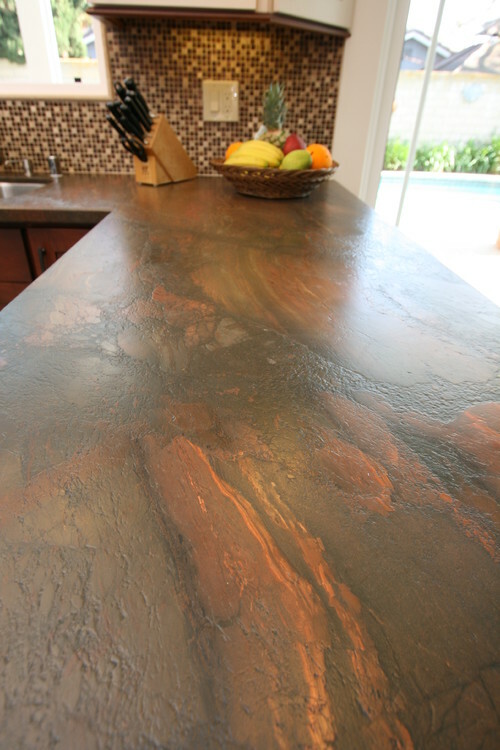 Above, the formica countertop is hard to distinguish from an actual travertine slab. You have to actually touch it to know that it is not the real thing. 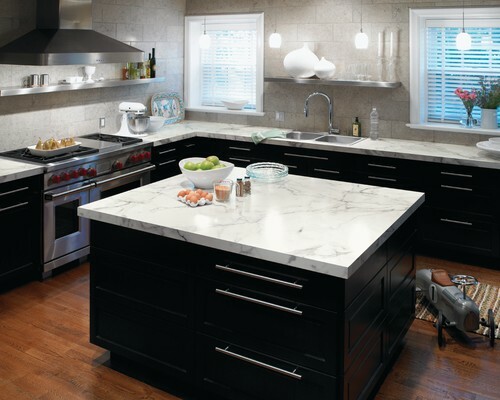 Above, a formica laminate countertop replicates the look of carrara marble. The seams can just barely be seen along the edges, when viewing this island in person. 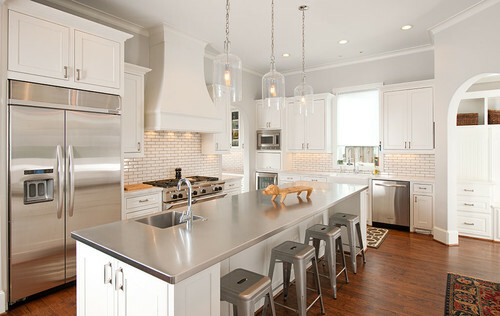 Another budget friendly choice is Corian countertops. Although using these in kitchens has just about gone the way of the dinosaur, they still make good options for other rooms. 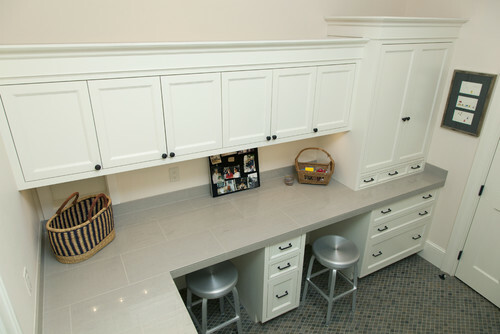 Laundry rooms and home offices can still look nice for a low cost with these. Another cost effective method is to use tile. I know that tile is no longer a popular choice for kitchens, but I felt it would be remiss to leave out this countertop option. As you can see (above), tile can and still does look fashionable when utilized properly. It also works very well for desktops. In this image, a large modern subway tile looks elegant and sleek in this home office. 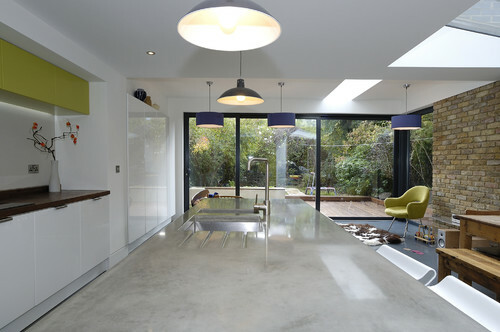 Concrete – It can be done in just about any shade that you can think of. In fact, a good mason can create veining and/or details that you would not be able to find in nature. However, just as with marble and soapstone, this is something that you either love or hate. If however, you are a neat knick and prefer a countertop that that can stand up to oil, wine, acids, and rough treatment, you may want to rethink concrete. If you do decide to go with this option, I would highly recommend finding someone with a lot of experience in making “quality” concrete countertops. Stainless steel- Another “you either love it or you hate it” material. These work great for families where they prefer sturdiness over perfection. These will scratch over time, so be prepared for that if you are considering these. However, that is also part of their charm. The dents and scratches just add to the character. I hope that this has offered you some much needed advice and information. As promised, here is the link for more information on testing and sealing countertop materials. (More on Testing & Sealing Natural Stones). Please feel free to share this via your favorite social media outlet -Facebook, Twitter, Pinterest, etc.